A view showing the RMAS tug IMPETUS heading down the Gareloch, with the new MoD Police boat 07001 beyond her. IMPETUS was built on the Humber by the Richard Dunston shipyard at Hessle, in 1993 specifically for handling Trident submarines at Faslane. IMPETUS, and her sister IMPULSE, are fitted with two azimuth propulsion units mounted aft, taking power from two 8 cylinder Allen diesel engines. With a gross tonnage of 319 tons, she is 32.53 metres long, and has a maximum bollard pull of 38 tons. As well being used for submarine berthing duties, these tugs have firefighting and anti-pollution capabilities. 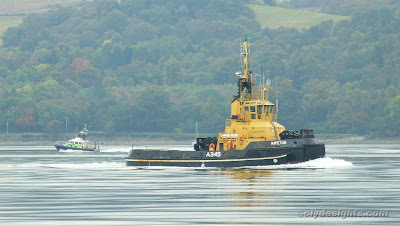 Serco Denholm now have the contract to operate the tugs attached to HM Naval Base Clyde.